From left: Agatha (Adeline Rudolph), Dorcas (Abigail Cowen), and Prudence (Tati Gabrielle) do their best witch stare. Netflix’s Chilling Adventures of Sabrina has many characters who are familiar to fans of the horror series from Archie Comics, as well as Melissa Joan Hart’s ‘90s TV show. There’s Sabrina (of course), the aunts, Harvey Kinkle, Ambrose, and beloved black cat Salem. However, there’s a new addition to Sabrina’s circle, and they’re weird as hell. During a visit to the Vancouver set of Sabrina, I got a chance to get to know the three actresses playing the Weird Sisters, a trio of young witches created just for the TV show: Agatha (Adeline Rudolph), Dorcas (Abigail Cowen), and group leader Prudence (Tati Gabrielle). 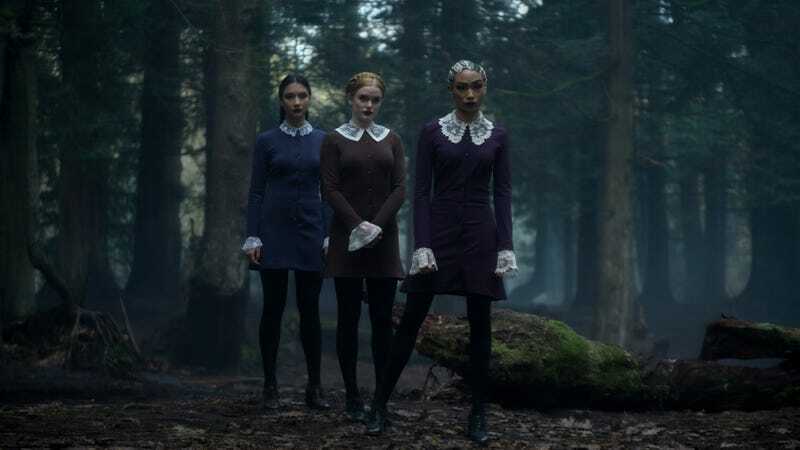 Advertised as a sort of Mean Girls-meets-The Craft group of bad witch teens, the Weird Sisters actually end up feeling a bit more like The Gifted’s Stepford Cuckoos. Much of what they say and do is in unison, reflecting their strange, otherworldly bond. “Tati, who plays Prudence, was already cast, so we had to basically kind of mingle with other girls to see who had chemistry,” Cowen said. “I didn’t find out until they actually got here who they had chosen. So I was like, ‘Oh my god, yes! Yeah! You two were my choices—they didn’t ask me but you two were my choices!’” Gabrielle added. Even though the Weird Sisters are designed to be this creepy collective, going so far as to wear nearly identical Wednesday Addams dresses, they do have traits that set them apart from each other. After all, they’ve had time to establish their personalities, since they’re not technically teenagers. According to Gabrielle, witches who’ve signed their souls over to Satan age much slower than mortals, so they’ve had time to mature more than the average 16-year-old. Agatha might be an experienced pro—at least in dishing out evil—but Sabrina was the first television series Rudolph ever filmed. She joked about how she had to quickly learn what terms like “blocking” meant, but also noted how she was thrown into the deep end when making the series. For example, on her first day, she (along with Sabrina and the other sisters) had to strip down to her underwear and make out with another actor. Chilling Adventures of Sabrina arrives on October 26.